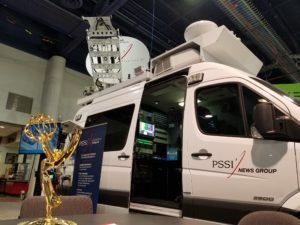 It’s been a particularly busy week for PSSI Global Services, in no small part due to our big splash at the 2019 NAB Show in Las Vegas. 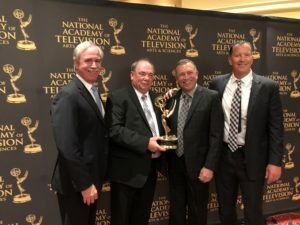 We kicked off the week in Vegas at the Wynn on Sunday night, where the Academy of Television Arts and Sciences awarded us with an Engineering and Technology Emmy. We proudly displayed the statue at our booth all week while our executive and sales teams touted our capabilities as the World’s Transmission Experts. We have some exciting opportunities ahead of us, from traditional satellite uplinks to teleport services to IP and fiber transmissions, and much more. Just because we were busy in Vegas didn’t slow us down around the rest of the country. Special thanks to our office and engineering staff for keeping everything moving full steam ahead! Let’s start off in Long Beach, CA, where Rick Ball’s doing some of the big-time multiplexing for IMSA that won us the Emmy in the first place. It’s the annual Grand Prix of Long Beach, an exciting weekend of street racing events that includes the 2019 BUBBA burger SportsCar Grand Prix of Long Beach on Saturday. 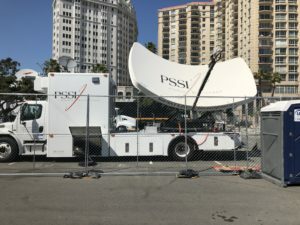 PSSI International Teleport’s right in the middle of it, as they take in all the IMSA and NASCAR feeds and send them along to NASCAR headquarters in Charlotte via AT&T GVS fiber. Our friends at NASCAR love to push the envelope of what’s possible in remote productions, and Rick is right there with them stride for stride as we enter what will surely be another great IMSA circuit in 2019. C15 at the IMSA race in Long Beach. 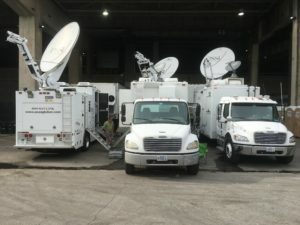 John May was there with Rick at the Final Four in Minneapolis last week for the final game of one heckuva stretch of March Madness transmissions for PSSI Global Services. It’s hard to say goodbye to hoops (and we haven’t entirely, thanks to the NBA), but it also means we have some room on our schedules for other sports. On the way back home to Texas, John stopped by Children’s Mercy Park in Kansas City, MO for Thursday’s Scotiabank CONCACAF Champions League action, when the Sporting Kansas City lost to CF Monterrey. Already time to get excited about college football. Dave Mitchell and the Arizona truck will be at Mountaineer Field in Morgantown, WV for the annual WVU Gold-Blue spring game, which will be the first time Mountaineer fans can see new head coach Neal Brown in action. And how about some bowling? Steve Hagerty and the K18 truck will be at RollHouse Wickliffe in Wickliffe, OH for the opening round of the NCAA Women’s Bowling Championship. OK, we’re still doing a little basketball. Blake Blomstrom and the C45 truck were at Capitol One Arena in Washington, DC on Tuesday for NBA action when the Boston Celtics beat the hometown Washington Wizards. We’re heading into the final few days of the Masters in Augusta, and Craig Henry and Kevin Spangler are looking forward to wrapping up yet another successful golf Major with our friends at Golf Channel this weekend. PSSI News Group is there, as well, as Charlie Neiswenter is right next to Kevin and Craig providing live shots for CNN. Not too far up the road from Augusta, our UFC crew has descended upon the great city of Atlanta for UFC 236, live from State Farm Arena on Saturday night. This huge pay-per-view will feature Max Holloway versus Dustin Poirier. Middleweights Kevin Gastelum and Israel Adesanya square off in the Octagon, and a bout between Khalil Rountree and Eryk Andres rounds out the Main Fight card. Our senior UFC engineers, Tracy Michaels and Jim Flowers, along with project managers Garrett Hunt and Keith Valeri, have been working with our friends at Concom for weeks to plan for the production and worldwide distributions of the press conferences, weigh-in, and all the other exciting activities leading up to the main event. Atlanta-based engineer Benny Griffis is there for multiple Ku-band paths, while Rick Varney’s in town for the C-band pathways. Gary O’Donovan rounds out our fight card by providing the emergency backup path out of the newly upgraded NT29. And the PSSI International Teleport is right in the middle of the action, as well, providing QC and turnaround services for multiple pathways, including distribution to the Pacific Rim via our full-time gateway between PIT and the Sydney Teleport. How’s that for a team effort? More fighting on our schedules. Mati Kerpen will take the newly refurbished NT28 to the Boardwalk Hotel in Atlantic City, NJ on Saturday for Shobox. Promoter Dmitriy Salita is calling Saturday’s event “the biggest women’s fight of all time,” as Claressa Shields and Christina Hammer meet in the ring in a middleweight unification bout. Should be a great fight! South of the border, Jose Sanchez and Abi Falcon are at the Arena Monterrey in Monterrey, Mexico to provide ringside commentary services for international broadcasters at the DAZN bout on Saturday. Jaime Munguia will take on Dennis Hogan to defend his super welterweight title in the main event, but Jose and Abi will be there all evening to provide their audio services throughout the undercards. Here in LA, John Jennings has the NT25 truck all set up at the Staples Center for a rare Friday night fight on ESPN and around the world. Senior project manager David Gallardo is on hand, as well, to ensure that all the international licensees receive all the boxing action they’re expecting. Audio guru Mark Huss and his right-hand man Oscar Zapata are also there to provide ringside commentary services to international broadcasters. Vasiliy Lomachenko defends his WBO and WBA Lightweight titles against Anthony Crolla in the main event, and we’re very excited to be working with our friends from ESPN and All Pro Productions on this big fight (and more to come). The fight’s production team had to delay their setup at Staples on Thursday due to the massive remembrance for LA legend Nipsey Hussle. Chris Hovden was there early in the morning to set up for the broadcast of what turned out to be a major television event. And last, but never least, we are racing. 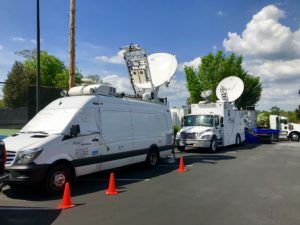 Kyle Meyer and Jonathan Ayala are at the helm of the C27 mobile teleport, providing extensive transmission and network services via fiber and satellite at the Richmond International Raceway. Here again the PSSI International Teleport figures prominently, as PIT is the hub between the track and NASCAR’s HQ in Charlotte. What a week it has been! Stay tuned for some exciting new projects!